Boheme, Hahn Woven Cotten, Fringed Throw, Blush. Condition is New. Dispatched with Royal Mail 2nd Class. Can be used as throw,bedspread,wall hanging,table cloth,curtain etc. Double size. Can transform a room in a simple and easy way. They work out at 1.50 p each !! Stunning MOROCCAN Textile Fabric Ivory & Silver Throw, Drapes, So Beautiful!! From the Victorian Trading Co. Mermaid Tail Knit Blanket Summon your inner siren on the sofa...lure a handsome sailor to join you for a movie at home. Sumptuous hand knit cable stitched cotton. Imported. Ocean Blue. Great condition No holes or odor Wizard Of Oz Woven Throw Blanket Tapestry 46 X 54. Condition is Pre-owned. Shipped with USPS Priority Mail. The Handwoven Throw is made of 100% cotton. It is perfect on a sofa, armchair or can even be used as a picnic rug. Handwoven cotton throw. Design: Herringbone. Material: 100% Cotton. Your privacy will be secured. Ian Snow Dark Purple & Green Pom Pom Cotton Throw. Ian Snow Dark Purple & Green Cotton Throw with Pom Poms. 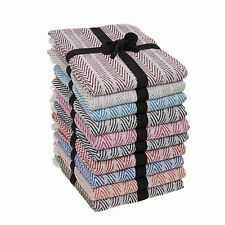 This is a beautiful, loosely woven soft throw in a natural and coloured zigzag stripe. Material: Cotton. A Very Large Fringed Sofa Throw/Bedcover.104"x 84". (I have another identical, but a bit larger listed). Very Large Fringed Sofa Throw/Bedcover.Terracotta weave.124"x 86"
A Very Large Fringed Sofa Throw/Bedcover.124"x 86". (I have two other identical, but very slightly smaller listed). 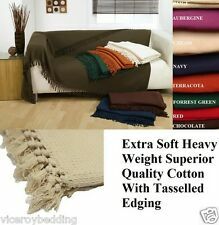 Size - 150x200cm RRP £70. Condition is Brand New. This Herringbone Striped Cranberry Throw effortlessly integrates with classic and contemporary themes alike. Featuring a subtle but stylish herringbone weave in red and white, and trimmed with a white tassel edge, it brings an extra touch of style to sofas and beds. Wrapped in a ribbon, it makes for a thoughtful gift for someone special, or a pretty treat for yourself. 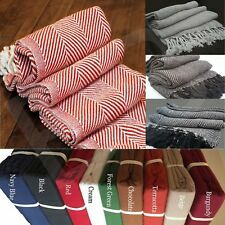 This throw is 100% cotton and dry clean only. This luxurious pure cotton herringbone throw in a beautiful charcoal grey colour features a traditional style herringbone weave and a grey fringed edge. 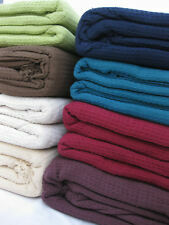 It can be used as a full bedspread, bed end throw or as an extra layer during colder winter evenings. Country Club Safi Throw 127 x 152, Rainbow. Modern accessories such as the Safi throw from Country Club will complete a living room. Machine washable. Great gift ideas. Wide range of use Four seasons universal: double sofa, single sofa, couch, window, small face, carpet, etc. This product is suitable for all kinds of leather sofas and cloth sofas. It can also correspond to the elbow sofa and elbow sofa! Laura Ashley Lemington Cranberry Polka Dot Throw. Brand New. 1.5x2m. 100% Cotton. Condition is New. Dispatched with Royal Mail Signed For® 2nd Class. Gorgeous Cath Kidston Crocheted Throw/ Blanket. Lovely Light Blue in colour. Photos are not really doing the colour justice! Only used as display on spare bed. Material :- 100% Cotton. In Burnt Orange. 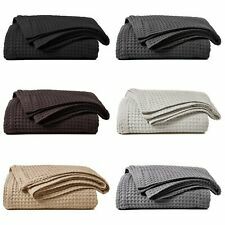 Cable Knit Luxury Acrylic Throw. Beds / Sofas / Usage As Throw Overs. 100 % Acrylic Face. 100% Soft touch Polyester reverse. sent once the funds have cleared. Woven Design. Be the talk of the beach with this fabulous Pineapple print Catherine Lansfield towel. The photographic print of pineapples in funky sunglasses, sat on a tropical beach, will have you dreaming of your summer holiday. Made from 100% cotton, it offers quick absorbance and long lasting softness, perfect for drying off after a relaxing swim. ---Size: 76cm x 160cm ---Colour: Multi ---Material: 100% Cotton ---Includes: 1x Towel ---Washing Instructions: Machine Washable at 40° C.
From the Victorian Trading Co. Mermaid Tail Knit Blanket Summon your inner siren on the sofa...lure a handsome sailor to join you for a movie at home. Sumptuous hand knit cable stitched cotton. Imported. Wild Orchid. Cotton hand crochet bed throw in a very good and clean condition, ideal for a single bed fully covered or, partially covered larger sized bed. It is pictures on a king size bed. The throw has a frill/bobble fringe effect around all 4 sides. 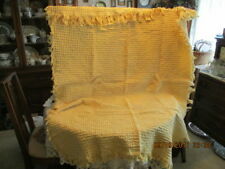 VTG Vintage Crochet Handmade Throw Blanket White, Pink Baby Girl 33" x 44"